"Great as a side with a ham or turkey!" Dissolve cinnamon candies in water in a saucepan over medium heat. Mix in gelatin and allow to dissolve; remove from heat and stir applesauce into mixture. Pour into a serving dish and refrigerate until set, about 2 hours. I thought this was ok. Others said they liked it and said it was delicious, but most of it was still left at the end of the dinner. This is been a tradition in our family for years but we use sugar free jello and like a bit more bite so I use a cup of red hots. 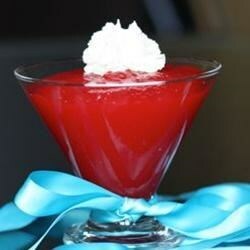 I hate sugar free jello but in this recipe it is awesome. Loved it last year but some comments about it being too sweet. Used unsweetened apple sauce and it was perfect. Repeat requests for this treat. Want to have some fun with this recipe? Make it in a blender, toss in some ice cubes & turn it into a Red Hot Ice Cold Smoothie. YUM! Our family has loved this for years, only we've always used Lemon Jello. Also, we ALWAYS double the recipe. It's wonderful.